At HEH, we are committed to changing the world. To do this, we have a unique approach to distributing food to those who are need. Our approach is this: Parner with as many people as possible to reach out, and empower them to reach out without doing it on HEH's terms. What makes HEH different from other humanitarian aid organization is that our vision is to help fulfill the vision of others. HEH is just one organization who can only reach out to a limited amount of people on it's own. However, if we partner with others to fulfill their vision for giving to their communities, the possiblities are endless. That's exactly what we do here at HEH. We empower people, churches and organizations to reach out to their communities in ways that would not be possible without a partnership. HEH stays anonymous in the outreach, and the local organizations remain at the forefront of people's attentions. You did the outreach, you get the credit. The way HEH accomplishes this is simple. We have the means to procure products at a price that most people or organizations could never do on their own. 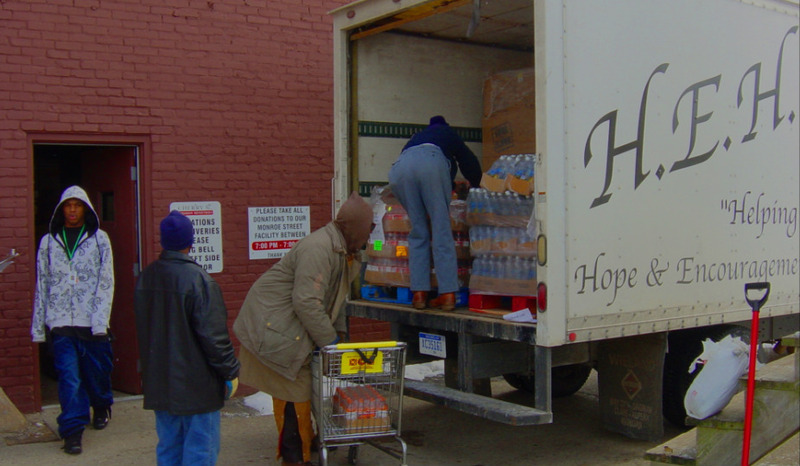 HEH is able to pick up, warehouse, and deliver food right to the site of the outreach. It would cost a small fortune for others who do not have the equipment, space, and connections to do the same thing. Reaching out with HEH is not as expensive as you might think! We have made it our goal to make large scale outreach as affordable as possible to allow the maximum amount of outreach within communities. To find out more about partnering with HEH to do an outreach, please contact us, click here to fill out a partnering form.